Jarrett: The ASICS Gel Nimbus are in their 21st iteration. It’s literally one of the most popular running shoes ever made. That means they have to have this shoe figured out, right? While a bunch of the features are expected of the Gel Nimbus, some of the new additions to this model are a dual-layered jacquard mesh upper, the combination of FLYTEFOAM Propel and Lyte, and a lateral full-contact outsole for a smoother ride. I reviewed this shoe in a 2E width, for all those wide foot runners out there. Austin: I’m just a normal runner, reviewing shoes in a normal width, but as you’ll see below, Jarrett and I came to many of the same conclusions. Jarrett: I’m a fan of the new mesh upper. I felt as if my foot was snug without it feeling constrained. My heel didn’t slip and I didn’t have to stop and adjust the laces mid-run. As for breathability, it’s winter time and literally freezing outside, but I never felt like my feet were super cold or overheated during longer runs. The biggest change to the Gel Nimbus 21 appears to be in the midsole. 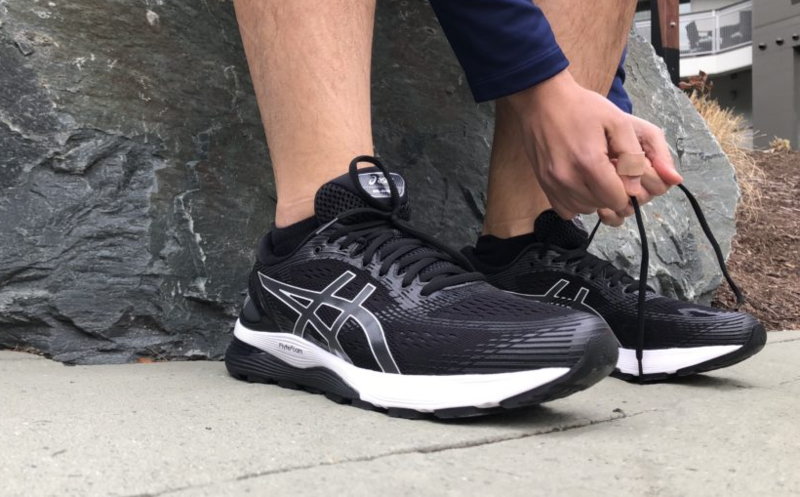 ASICS has taken the following and smashed them all together: FLYTEFOAM Propel, FLYTEFOAM Lyte, SpevaFoam 45, and two areas of the iconic ASICS Gel cushioning. This has created a shoe with a ton of cushioning. What I noticed the most was how low-impact it felt on my heels while running downhill. This is extremely enjoyable because it means less impact on my knees and less issues with my weak sit-at-my-desk-all-day hips which equals less time at physical therapy. Which equals more money to buy more shoes. So long as there is responsiveness (spoiler alert: there’s not), I can dig highly cushioned shoes! 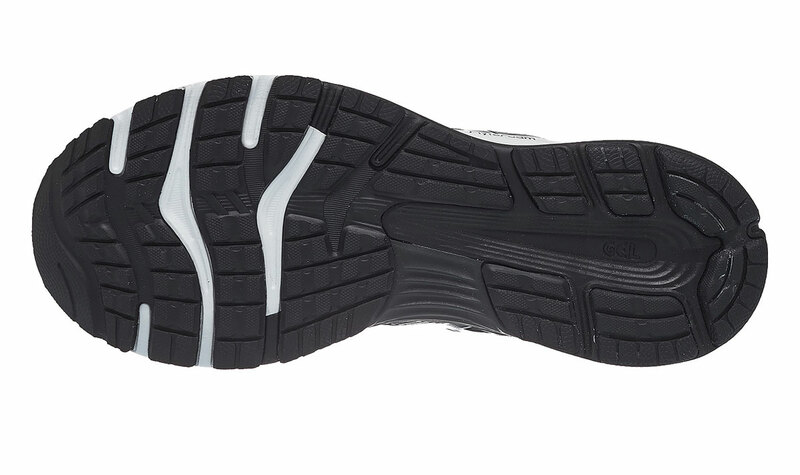 Some horizontal breaks were added to the new outsole designs which helps with the flexibility. I hate shoes that feel stiff so this gets my approval. The size of the Trusstic system was also cut in half and now only appears on the medial side. I’ve had some older ASICS shoes where the Trusstic went all the way across the outsole and it led to stomping. I actually did feel like there was a relatively smooth transition while running in the Gel Nimbus 21. A few smaller details I appreciated were the comfy heel collar and the large ASICS logo on the side being reflective. I run in the city and always worry about drivers not seeing me. Safety first! Austin: Like the 20 versions preceding it, the Nimbus 21 delivers on the promise of protection and support. I placed my feet in the shoes and quickly thought of the Nimbus 20 (with a few critiques below). The revised upper mesh and minimal overlays kept my feet in place without any irritation during runs. Likewise, the external heel counter performed admirably. I felt no motion or sliding on or around the Achilles tendon. It locked the midfoot down easily with laces that have a bungee quality about them. As for the ride, once again, the Nimbus 21 shines from a cushioning standpoint. GEL cushioning, Flytefoam Propel, Flytefoam Lyte, SPeVA 45 lasting foam, and a thick sockliner clearly make for less road feeling. To my surprise, the Nimbus 21 did have a responsiveness about it. I figured layer upon layer of cushioning would create a burdensome sinking feeling (see: HOKA Bondi), but it felt somewhat snappy at hard paces. Outsole traction is solid. No surprise there. Jarrett: I usually run in stability shoes, so I got excited by the thought of a ligher neutral trainer to run in. 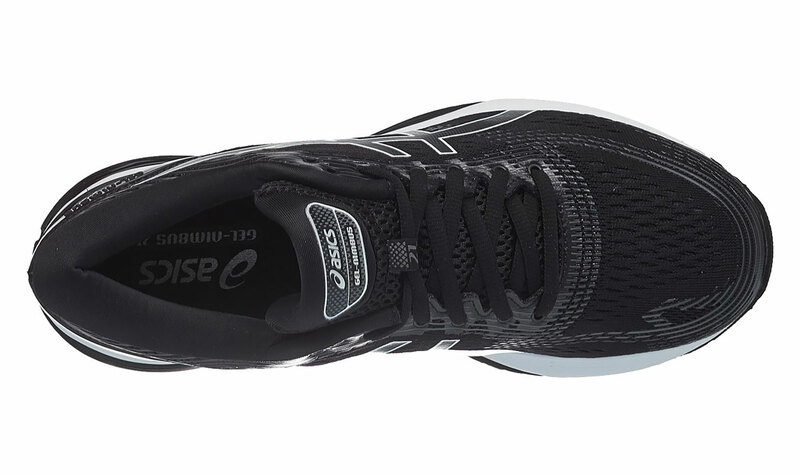 Then I looked the specs on ASICS’s site: 10.9 ounces. Damn. Since have wide feet, I received the 2E modeI in size 10.5 and threw them up on my digital scale— 11.4 ounces. HOLY CRAP. I mean, most shoe companies have managed to get a stability shoe well under the 10 oz. mark; 11+ ounces is just too heavy for a neutral shoe in today’s market. 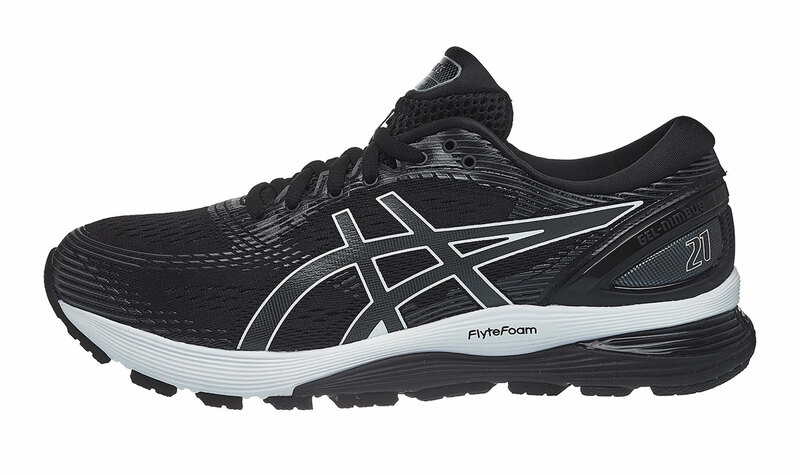 ASICS claims the Gel Nimbus are perfect for long distances. Well, I took these out for my Saturday 14-mile long run and at first I was cruising, but eventually I fell apart. My legs were exhausted. There is so much cushioning, but just not enough energy return. After 30 miles, I also noticed a good amount of wear to the outsole under the forefoot. I’m not sure if it’s cosmetic, but it could be of concern to grip and durability 100+ miles in. That being said, the high abrasion rubber under the heel barely has any wear showing. But also— only 30 miles. A couple issues people had with the previous model were a narrow toe box and a poor fit. Honestly, I probably could have sized up from the 10.5 to an 11 in the Gel Nimbus 21. I run in a 10.5 in other brands like New Balance, Brooks, or Under Armour. I also noticed a slight hot spot on left pinky toe. I never got a blister, but I definitely noticed pressure during runs. This all makes me wonder how messed up sizing was before if the shoe still has issues. Lastly, I don’t like the price point. The Gel Nimbus 21 retails for $150 (a $10 drop from the previous version). The price drop is nice, but this is still way too much for this shoe. You’re bumping up into weirdly upper-class On pricing and elite training shoe territory at that point. I fully expect any shoe at $150+ to be near perfect as there are plenty other shoes out there for much cheaper. Austin: According to ASICS, the Nimbus 21 has a wider toe box than the 20, but I disagree. I observed more toe splay in the 20 and more lock down in the forefoot. This didn’t impact my runs, but there is a width difference up front. Next, I thought the updated upper, midsole material swaps, and removal of the TRUSSTIC on the lateral side would drop the weight some, maybe an ounce even. Alas, the Nimbus 21 gained three-tenths of an ounce (11.1 in a men’s nine). Finally, there’s minimal flexibility in the Nimbus 21, which is why my easy runs didn’t feel ideal. While I recognize that not every run is going to be fantastic or issue-free, an easy run should be accompanied with the disappearance of the shoe as the miles unfold (see: Saucony Kinvara 10). Jarrett: If you’ve ever seen Arrested Development, the ASICS Gel Nimbus 21 are the Ann Veal a.k.a. “Bland” a.k.a. “Egg” a.k.a. “Her?” of running shoes. I’m not saying they are bad shoes, it’s just that they are boring. Like, when you tell someone you bought them for $150, they might say “Those?” There’s nothing exciting about them. For people with 3+ pairs of running shoes, you’ll probably forget you have these. The Nimbus 21 are solid trainers, but if I’m going to spend $150 on running shoes, I want more. Austin: For the runner seeking a protective daily trainer that will last hundreds of miles, the Nimbus 21 is worth a look. The price dropped this year too: $160 to $150. I don’t know if this is due to the midsole substitutions, but running shoes typically don’t fall in price. If anything, they rise. The Nimbus 21 is a workhorse for sure, a model capable of easy runs, long runs, and recovery runs. Workouts? I suggest the Roadhawk FF 2. As the wide-shoe reviewer for BITR, Jarrett is on a never-ending search for the Cinderella shoe to fit his Yeti feet. He currently lives in Baltimore where he enjoys running roads and trails with November Project and Faster Bastards. He also loves craft beer, donuts, and pretending to be elite in his NormaTec boots.